Paris, France -- The whole human race is in mourning ... Over the past days I have offered incense and recited Buddha's name every day to send energy to the victims and their families. The whole world is shaken by the disaster in southeast Asia. Indonesia and Sri Lanka have suffered most of all. The tsunami even reached the shores of Africa and hundreds of people on the coast of Africa have lost their lives. Although we are sitting here, a part of our heart and body has died also. Many people from northern European countries such as Sweden had gone on holiday to this area looking for a quiet, unpolluted and warm place to take a break, and in a few moments the tsunami took their lives. Scientists are saying that if Southeast Asia had had a system of alert, some people could have avoided the catastrophe. A warning system could have given people four hours time to leave the coastal areas. However, even if there had been a system of alert how could ordinary people have been alerted; those who do not have radio, TV, those who are working at sea, on the land or the children? The westerners who lost their lives in the tsunami were mostly vacationers, who went there to escape cold winter weather, but some of those who died were here to do charitable work. They did not come here on holiday but to offer their services. This calamitous event urges us to look deeply and consider the condition of the human species. In Christianity, the question of why there is this kind of suffering has been discussed through the ages. Why does God, who created the world with all its species, allow such suffering to take place? This has been a subject for theologians throughout time. In Buddhism we speak of Cause and Result. We say that we have to bear the consequences of our actions. Still, people ask: "How can children of three or five years old have done such evil acts that they have to lose their parents or their own lives?" How can we explain the law of karma? Whether we are Christian or Buddhist, this disaster poses questions for us. Christian believers ask: "How can God, who loves mankind, allow things like this to happen?" Buddhists ask: "How could people who have come with the best of intentions to help others and were doing charitable work, or innocent children, have committed such a crime that they should die in this way?" Some people say that although during this lifetime they had not committed crimes they may have done so in a past life. We try to provide answers like this. The French poet Victor Hugo at the age of 40 or so lost his daughter who was about 20 years old. Her name was Leopoldine. He suffered deeply and asked God why this should have happened to her. She too was drowned. A tender flower just opening suddenly snatched away by a wave. When his daughter died, he went back to his birthplace Villequier. In the poem entitled At Villequier, he says: "Mankind can only see one side of reality. The other side is plunged in the darkness of a frightening mystery. Mankind bears the yoke without knowing why. Everything he sees is short-lived, futile and fleeting." Victor Hugo calls on God: "I come to you, God, the Father in whom we must believe. Calmly I bring you the pieces of my heart filled with your glory, which you have broken. I accept that only you know what you do, and that mankind is only a reed that trembles in the wind." In Plum Village, we have often studied rebirth and the cycle of samsara. We know that in popular Buddhism, the teachings of rebirth are based on a belief in a self or soul. It is said that when someone dies, they are reborn as another person or an animal. There is faith that we continue. When we die, we do not cease entirely to exist. We continue in a different form, and that is what we call the cycle of birth and death. We have learned, however, that in the deeper Buddhist teachings, we have to understand rebirth in the light of no-self. The basis of Buddhist teachings is the teaching on no-self. If we understand rebirth and the cause and result of action in terms of a self, we have not yet touched the deepest levels of the Buddhist teachings. Similarly the matter of evil also has to be resolved in the light of no-self. When people ask: "Why do I have to undergo suffering and calamity, while others live carefree?" and "Why should an innocent child be forced to bear such wretched misery?" Most of the answers we receive to these questions are based on the idea of a separate self. We know that when we base our thinking on the idea of a separate self, we have not yet found an answer that is consistent with the teachings of the Buddha. All the questions of cause and result, retribution and rebirth have to be resolved in light of the teachings of no-self. We have studied karma according to the Manifestation-Only teachings of Buddhist psychology, and we have seen that there is both individual and collective karma. We might expect that the people of Southeast Asia who are born, grow up, and make their living there would be killed in the tsunami that took place there; but why should tens of thousands of Westerners go there to meet their deaths? At this moment there are thousands of Westerners who still do not know whether their loved ones have survived, and as every hour passes their hope diminishes. When an aircraft explodes and crashes and nearly all the passengers die but one or two survive, we ask: "Why? Why did they not all die? Why did one or two live?" This shows us that karma has both an individual and collective aspect. When we discover the principle of individual and collective, we have begun to resolve a significant part of the matter already. If we continue in the direction of the insight of no-self, we shall gradually discover answers closer to the truth. In the war in Vietnam, both the country and its people were subject to enormous destruction. Why did those two million people die while other millions did not? Looking into this carefully, we shall see that even those who did not die, did die, though in a different way. It is very clear that when someone we love dies, the person who dies suffers less than those who outlive him. Therefore suffering is a collective and not an individual matter. Victor Hugo, in his life as a poet, was seeking and looking deeply and therefore many of his poems are meditative in nature. His contemplative poems are collected in a volume called Les Contemplations. Contemplation means looking deeply. Victor Hugo also found that human destiny is a collective destiny, and he caught a glimpse of the no-self nature of all that is. If any accident happens to one member of our family, the whole family suffers. When an accident happens to a part of our nation, it happens to the whole nation. When an accident happens to a part of the planet Earth it happens to the whole planet, and together we bear it. When we see that their suffering is our own suffering, and their death is our death, we have begun to see the no-self nature. When I light incense and pray for those who died in the tsunami disaster, I see clearly that I am not only praying for those who have died; I am also praying for myself because I, too, am a victim of that earthquake. We ourselves have died, too. There are not just the 155,000 dead. Whenever we love, we see that the person we love is ourselves; and if our loved one dies, we also die. Although we are sitting here, and we have the impression that we are alive, in fact we have also died. What happens to one part of the body happens to the whole body. The human species and the planet Earth are one body. I have the feeling that our planet Earth is suffering, and this tsunami is the cry of the earth as it writhes in pain: a lament, a cry for help, a warning. We have lived together so long without love and compassion for each other. We destroy each other; we abuse our mother Earth. So the Earth has turned back on us, has groaned, has suffered. The Earth is the mother of all species. We make each other suffer and we make our mother suffer. These earthquakes are bells of mindfulness. The pain of one part of humankind is the pain of the whole of humankind. We have to see that and wake up. In the past, whenever there was a natural disaster, such as a flood, an earthquake, or an epidemic, the rulers in Asian countries believed that they as rulers had not lived up to their responsibilities and that was why the natural disaster had befallen their country and their people. When a natural disaster occurred, rulers in Asia would commit themselves to practising vegetarianism, sleeping on a mat on the ground and praying. The ministers at the court also were vegetarian, slept on the ground and prayed for many weeks. There is something very commendable in that. It means that the king has seen his responsibility. He has seen that he has lived and ruled in such a way that has allowed disasters to happen to his country. Eating vegetarian and sleeping on the ground was the way that the king and the ministers had of beginning anew. There is something very beautiful in that. But our own politicians do not look at life in that way, and this custom no longer exists. We are not politicians or kings, but when we are aware of the suffering and misfortunes that are happening to the Earth and the human species, we too should eat vegetarian meals and lie on the ground. We also have to renew and better ourselves, because karma is collective. All of us, to some extent, have contributed to the collective karma. A disaster that happens to any part of our planet earth or the human species is something for which we all have to bear responsibility to some extent. When others die, we die; when others suffer, we suffer. When others are in despair, we are in despair. That is the insight of no-self. The insight of Victor Hugo is the beginning of the discovery and realisation that goes beyond the idea of a separate self. When people see the no-self nature of painful events, they can accept them and they do not protest to God or protest against the lot of humankind. In the Tao Te Ching (a Taoist work) there are the words: "The heavens and Earth are unjust if they look on all species as straw dogs. The holy ones are inhuman if they also look on all species as straw dogs." "Straw dogs" are those not worthy of consideration, without any significance. If the heavens and Earth give birth to countless species of beings just so they can suffer and die, then Earth and sky are truly inhuman. The "holy ones" here are the rulers, the emperors. The commands of the emperor were known as holy directives. The opinions of the emperor were known as holy thoughts. Rulers can determine the destiny of the people. They decide whether to subjugate the people or whether to go to war, and so they can be inhuman just as the Earth and sky can. These words are protests about the lot of humankind. We shall soon recite the name of our teacher, the Buddha, and the bodhisattvas Manjushri, Samantabhadra and Avalokiteshvara. As a sangha body we should produce the energy of compassion and mindfulness. We should embrace the planet Earth as we pray for all the victims and their families who are grieving them. Some of them can hold each other as they weep. Others have no one to hold as they weep. We should pray for ourselves because we also are victims of the horrendous disaster which has just happened. Please look deeply. This is a chance for us to grow in understanding. Whether you come from a Christian, Jewish or Buddhist tradition, you have to look deeply. The key to our contemplation is no-self. Victor Hugo was Christian; he found a way to go beyond the separate self. We have to look deeply to see that we are the dead. We are that orphan, that child is us. Only by contemplating in this way can we accept and clear the tremendous pain that we have today. 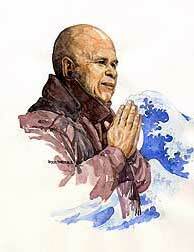 The article is an excerpt from a dharma talk given by meditation master Thich Nhat Hanh in Plum Village, France, on December 30, 2004.